Looking to hit the water for a day of fishing? Trying to find out what kind of fishing vessel is right for you? Well you have a few options to choose from. 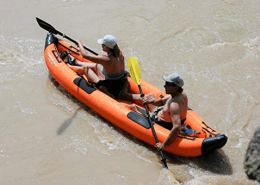 You can get a fishing kayak which is designed specifically for hitting the water for a fun filled day of fishing. But what if you plan of fishing with a group of people? You can get a bigger boat but that may cost a substantial amount of money. Or you could purchase an inflatable fishing boat. These boats are designed to easily be transported from place to place while also having the ability to easy and quickly filled up. 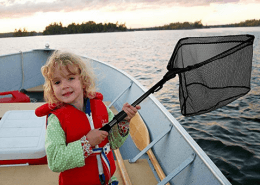 You can use an inflatable hand pump for this purpose but oftentimes these larger inflatable fishing boats come with an electric pump to help you get through the process of filling it up even faster. These boats are perfect for those weekend trips with the family or group of friends when you just want to hit the water for some fun and relaxation. If you’re on the market for an inflatable fishing boat then you’ve come to the right place. 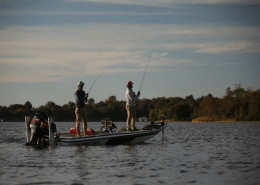 Here is our list of the best inflatable fishing boats for the money in 2019. The Intex Excursion 5 is an inflatable boat that’s meant to safely and comfortably carry up to 5 adults in calm waters. It measures 124 x 65 x 17 inches and has a maximum capacity of 1,100 pounds. There are 2 inflatable seats with backrests — one on each side of the boat. The floor is also inflatable to keep it rigid as well as comfortable. This inflatable boat is made of a durable, puncture-resistant vinyl. In the unlikely event that it gets punctured, though, you won’t need to worry because it’s designed with 3 air chambers. 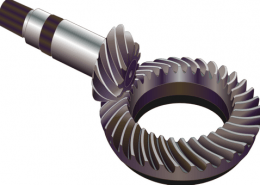 Even if you end up puncturing 2 chambers, you’ll still be kept afloat but the inner auxiliary chamber. Two of the chambers use Boston valves so it doesn’t take much to inflate and deflate. Even though it’s incredibly large, the Excursion 5 by Intex is easy to handle in and out of the water. It has grab handles on both the stern and the bow. It also has a grab line that goes all around the boat. It also has two pairs of oar locks that are welded on. To keep from losing your oars, it also has two oar holders on each side. Additionally, it has 4 fishing rod holders as well as the right fittings to accommodate a motor of up to 1.5 HP. 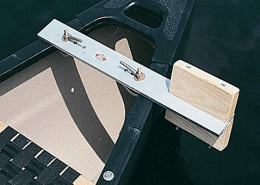 The entire set comes with aluminum oars that are 54 inches long, a high-output pump, and a repair kit. 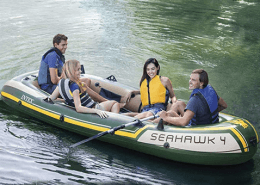 The Intex Seahawk 4 Boat Set includes an inflatable boat, 2 French oars that are 48 inches long, a high-output hand pump, and a repair kit. The inflatable boat measures 138 x 57 x 19 inches and has a maximum capacity of 1,050 pounds. 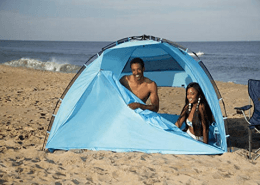 It has enough space to comfortably seat up to 4 adults in calm waters. The Seahawk 4 by Intex is made of a rugged, puncture-resistant vinyl and has 3 air chambers to guarantee that you stay afloat no matter what happens. Two of the chambers use Boston valves to they’re easy to fill up and deflate. On each side of the boat, there are inflatable cushions that serve as seats. The floor is also inflatable to keep it rigid and more comfortable. The Intex Seahawk 4 Boat is equipped with two pairs of welded-on oar locks and oar holders on each side. It also has two fishing rod holders and the proper fittings for a motor mount. There is only one grab handle which is located on the bow but there is a grab line that goes all around. 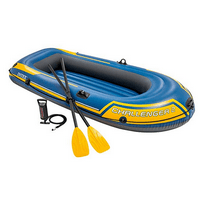 The Challenger 2 boat is made of puncture-resistant PVC and is designed with 3 air chambers. 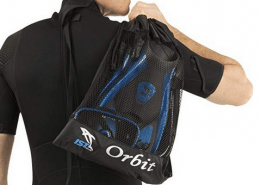 These serve to make sure you and your companion stay afloat no matter what. The chambers are fitted with Boston valves so they’re easy to inflate as well as deflate. The floor is inflatable as well. Apart from extra buoyancy and rigidity, this makes the boat more comfortable. The Intex Challenger 2 has a grab handle located at the bow and a grab line that goes all around the boat. It is equipped with a pair of oar locks that are welded on. Each side also has oar holders to keep them in out of the way but in place when not in use. 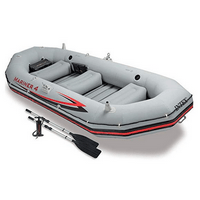 The Intex Mariner 4 is an inflatable boat that measures 129 x 57 x 19 inches and has a maximum weight capacity of 880 pounds. Although it can technically carry up to 4 people in calm waters, it would be most comfortable with only 3 adults on board. This inflatable boat is made of extra-tough PVC that’s puncture-resistant. It also resists damage from impact, abrasion, and sun exposure. It is composed of 3 different layers (2 heavy-gauge PVC layers and 1 polyester mesh) and it is inflated through Boston valves that make it easy to fill and deflate. Its flooring is made of heavy-duty extruded plastic and it has 3 inflatable seats. The keel is inflatable as well and that makes the boat easier to control. The Mariner 4 is equipped with rotating oar locks. It also has oar holders, fishing rod holders, and motor mount fittings. It has a rock guard and a grab line that goes all around. Additionally, there are grab handles on each side of the boat. The set comes with the inflatable boat, a pair of 54-inch aluminum oars, a high-output pump, and a repair kit. This is a great inflatable raft. 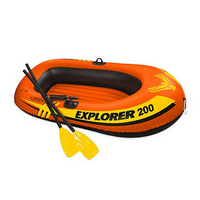 The Intex Explorer 200 is an inflatable boat designed to be used in calm waters like pools or lakes. When inflated, it measures 73 x 16 x 37 inches and can safely carry a total of 210 pounds. While the manufacturer meant for this to be used by 2 people, it’s likely too small for 2 adults. For maximum comfort, it is probably best used by 2 children or an adult and a child. The weight capacity isn’t enough for 2 adults either. 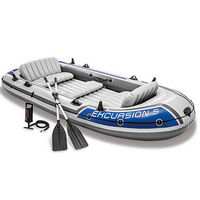 This inflatable boat is made of 13-gauge PVC plastic. 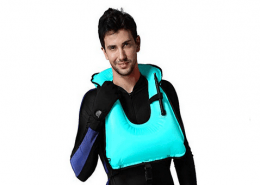 For safety, it has a 2-chamber design so it will stay afloat even in the off-chance that the outer layer gets punctured. The floor of this boat is inflatable as well. Apart from making it more rigid, this helps make it more comfortable. Other features include oar locks that are welded on and a grab rope that’s located on the bow. Apart from the boat and 2 oars that measure 48 inches each, the Intex Explorer 200 Boat Set comes with a small hand pump and a repair patch. This is on the cheap side when it comes to inflatable fishing boats but its more than enough for a father and son duo.